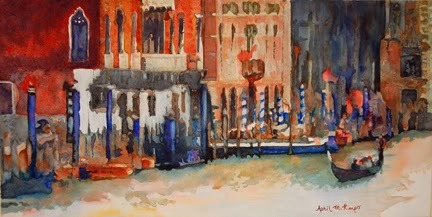 April M. Rimpo: "Venice III" watercolor 14" X 28"
"Venice III" watercolor 14" X 28"
Venice III captures Venice life using textures to provide the feel of the buildings, while maintaining the softness of the water in the canal. As many of you know I love to use an orange/blue complementary color scheme. Venice III screamed for those colors since those are common colors in Venice. I just love the blue striped poles scattered along the canal where gondolas, water taxis, and other boats can tie up to let off their passengers. This painting received an Honorable Mention award. Donated to the Howard County College President's Gala 2017 - Scholarship Fund fundraiser. Since Blogger added the Pinterest button, do you mind your work, blog being Pinned? Very nice painting and a generous gift!